already had a taste of Howling Bells’ forthcoming new album thanks to the newly-released single ‘Slowburn’, and one thing we can say for sure is that the London-based four-piece are back and re-energised in a very noticeable way. It seems that the days of their dark indie leanings are somewhat behind them and, as lead singer Juanita Stein explains, there’s a very good reason for it too – motherhood. 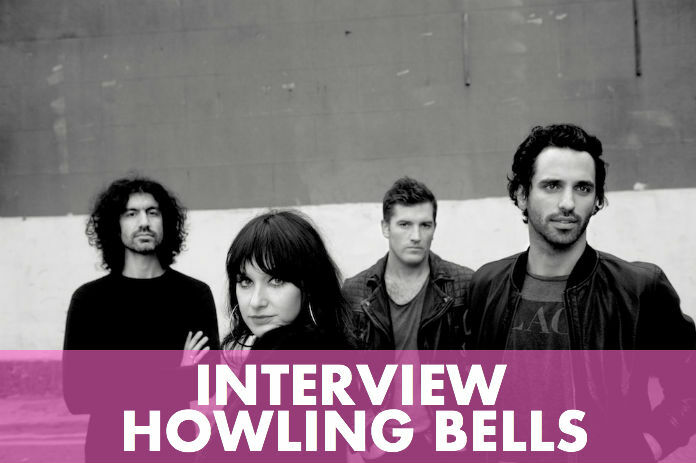 It’s been a very busy year for Howling Bells already compared to last year. We had a bit of a break and we all kind of went off and did our own thing towards the end of last year. Getting together again and making a new album was bee a very natural process and we recorded the songs very quickly, so this year has been all about releasing new music. We’ve already released one song [‘Slowburn’] so we’ve let that one out of the bag in the lead up to the show [April 7, London’s Oslo]. We have 11 songs and we literally did one song each day. We just had this rush of creative inspiration. We’d sent a whole bunch of demos to some people, one of them being our dream producer Alan Moulder, but at the time he was busy mixing another project. He mentioned Catherine [J Marks], his right-hand gal, so they let us know their availability and we worked around that. In the end we spent 11 days with them and got it all done. What’s the feedback been like for ‘Slowburn’? It’s been brilliant. Lots of great feedback. We’ve been pleasantly surprised by what people have said. They’re very kind and they’re liking it very much, which means a lot to us because it’s our fourth album now. There is a lot more energy and it’s a lot more combustable compared to our last two albums. The comments have been fantastic and encouraging which is what you want to hear after you’ve disappeared into a hole for a while just writing the songs. And so many new bands are coming out all the time and it’s so easy to get forgotten these days, so to still be considered relevant is great. What’s the story behind ‘Heartstrings’? I had a baby and it’s changed my life. It one million percent focuses you in a different light, it changes the way you see the world and everything in it. It’s a really old cliché for a female artists to say that after having a child for the first time. It really has brought out a different energy in me but I didn’t expect or anticipate feeling so energised and enthusiastic. I didn’t think a feeling like this existed – excuse the word – but there is a magic about it. Having a baby places you in a different universe. Things that used to be integral to your existence become almost humours and nowhere near as important anymore. The songwriting came as a result of not being as hard on myself as I used to be. As an artist you tend to be critical of yourself and you place impossible pressure on yourself. It’s nice to have your priorities checked and feel like that pressure is off. It makes you create in a very different light, and I think this album sounds like it. You’re originally from Australia so why did you move to London? It’s been 10 years now that we’ve been here, which is strange. It was definitely the music and the art and the fashion and the crazy energy and urgency of this place. It’s all the things that you get from this place combined. I think a decade ago London was a fairly different place, though. I think it was a lot harder and the cultural gap seemed wider. I find that the world literally feels a lot smaller and more accessible and I feel the cultural gap between Sydney and London is not so great now. I really felt when I first moved here that you had to go on this cultural treasure hunt for something as simple as a decent cup of coffee. The industry isn’t very different though, it’s just bigger in London. I try to go back to Australia every one or two years but most of my family are in Europe anyway. It’s nice to go back and get your head intact and get some sunshine. You’ll have your first gig on the back of ‘Heartstrings’ this April – will a full tour follow? From what I know there is going to be a full UK tour in June, all the dates are up on our Twitter. I imagine there will be another tour later in the year to support the record as well. Other than that, that’s pretty much all of us plans for now. There won’t be a Howling Bells ‘reality TV show’ or anything too exciting like that, we’ll just be touring and playing in-stores and stuff like that. Hopefully there’s be some fun photo shoots and videos too!